VP Dr. Jesse Hong leads a workshop on ProAnalyst. 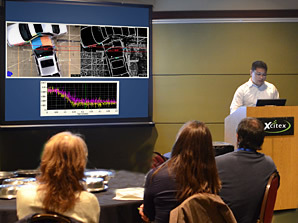 This 4-day program is designed for scientists, engineers, and photographers who need to gather data on rapidly moving subjects and events for study, motion analysis, and troubleshooting. (Read more) The course will be held June 15-18, 2015 at the Edgerton Center at the Massachusetts Institute of Technology – home of Doc Edgerton's Stroboscopic Light Laboratory, where much of the history of the field was written. The course content consists of a series of guest lectures from industry experts on a wide variety of subjects, including lighting, lens selection and theory, use of high-speed cameras, stroboscopy, and motion analysis. In addition, high-speed camera experts will present the latest in digital high-speed camera technology. Mornings are spent in the lecture hall; in the afternoon, invited experts conduct small break-out group lab sessions to provide more information and experiments.